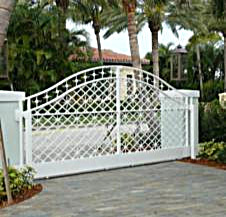 Driveway gates are such a common sight at premier homes and private communities. You know when you’ve arrived at some place unique when you find yourself faced with these formidable entrance ways. It’s true that most people associate iron driveway entrance ways with great wealth and success, nonetheless, you will find these elements in numerous types of locations. These are more affordable than you might imagine, and might even be a consideration for your own property. There are actually numerous factors for installing a home design improvement such as this. I will talk about one of the most vital reasons shortly. Most of us can bring to mind the very first time we drove through an ‘expensive’ neighborhood and seeing one of these amazing gates. Mine was when I first moved to Florida and was taken on a drive/tour of the Florida Intra Coastal to see the beautiful homes. As we drove past these lovely residences, what was most eye-catching were the awe-inspiring iron and metal driveway gates which were the entrances leading up to the homes. It was almost as if they spoke to me. And the emblems so predominantly placed at the middle of these gates, well, what can I say? It was something to aspire to. And why not? To me, it was a mark of achievement, success, hard work and dedication in life enabling these people to have, and enjoy the beautiful homes they live in. Wrought iron work has been around for centuries and is one of the most long-lasting materials today. Although, as explained in our other articles, for damp, salt air environments, aluminum is the best way to go. Wrought iron will rust and deteriorate in these locals. There are many kinds of driveway gates. Some are electronic, other designs are mechanical. Electromechanical driveway security gates use power from the mains. This power is used to open the driveway gate letting in the person standing outside. By and large there are three categories of electromechanical driveway gates i.e. Worm driven driveway gates which are also known as Screw type driveway gates, articulated arm operated driveway gates and underground operated driveway gates. Electrical and automatic driveway Gate openers are designed for both forms of driveway gates i.e. the sliding gates and the swinging gates and also the fences. These gate openers can be programmed to open with a manual apparatus. One can also use a wireless transmitter. Aside from the beauty we spoke of, a metal or iron driveway gate is the first line of protection that your house has against unwanted elements. They are extremely useful to keep intruders at bay. Also identified as driveway security gates, they’re often the basis of many a foiled robbery plans. They are often customized according to the wishes of a house owner, and the best resource available to safeguard your property against unwanted elements or to keep them at bay. 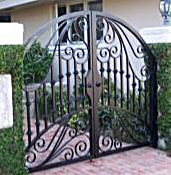 Today artisans create intricate and stunning designs on these wrought iron or aluminum driveway gates. They can form a contemporary design, or create an antique wrought iron look. You can even pick from a enormous variety of colors that will compliment any outdoor home design or color. Please feel free to contact us with any and all questions or inquiries you may have. We will be happy to advise and consult with you, answering all questions you may have regarding your consideration of installing your new driveway gate. Or on any wrought iron, and aluminum metal and Iron products you may be considering for your home or business. We will work closely with you every step of the way in the design and superior creation of your desired iron work home design product.